A full, single playthrough of the game, without skipping any of the dialogue, takes a little under 10 minutes. Some elements of the game are randomized, and you may want to play it more than once to see different outcomes. This was good fun! Great art and music and... I love the pico 8! Really loved the artwork! The dialogue was funny too. As others have said I wish I could skip through the text faster, but you already know that :) Great job! 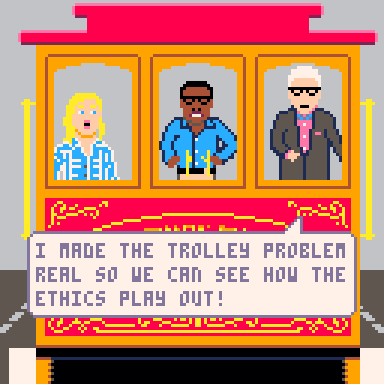 Loved the Good Place TV show, so loved this set up, it's very faithful to the show :) Lovely pixel art, and sounds. When the random things turned up, it made me go what?! hahah! funny! good job! This one i've been waiting for! But man, the speech bubles are too slow, you should have let the player press a button to go to the next line of dialoge. Also, some sort of sound when characters were speaking (forgive me for bringing up Undertale, but, like in Undertale) would have also been great. But that's all nitpicking! I do love the overall style of the game, and the episode choice is interesting. I totally agree about the button to skip bubbles and the chat sound, and they would have made it in if I'd had more time. As for them being too slow... All I can say is that one person's too slow is another person's too fast. :) The button to skip would be the ultimate solution for that. This is really cool! I love the dialogue between the characters. 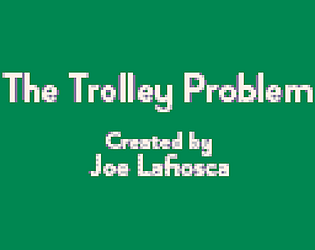 The visuals and animation is very well done, especially for PICO-8. 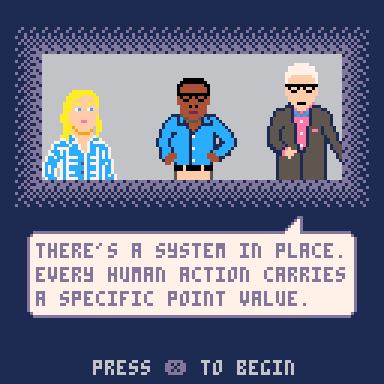 I also made a game inspired by The Good Place. I was literally just playing through your game while you wrote that comment! Great work! 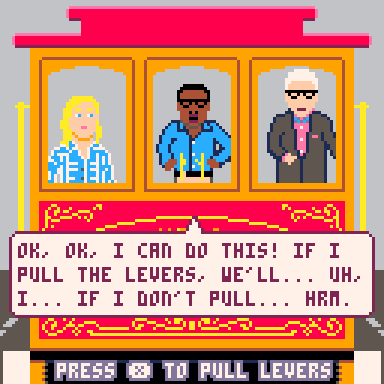 :) I'm a big fan of both Papers, Please and The Good Place, so it was a good matchup for me. Very faithful recreation of the episode! 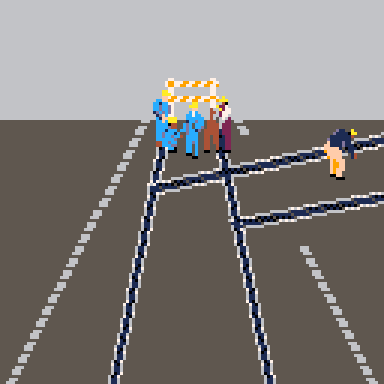 Nicely done faux 3D effect in pico8 and the humor was spot on. Tried replaying for another scenario but it was a little tedious to go through the starting dialogue again. It doesn't feel that there's much gameplay to it, although it was fun seeing the other random scenarios pop up. Thank you, totally agree on the dialogue. There are some places you can skip it, but there could definitely be more. And the fact that the first 2 scenarios are always the same (for the setup) before you reach the randomized ones also makes that more sluggish. I was excited to play this when I saw the previews on Discord! I'm glad that the final product was as fun as I was hoping. 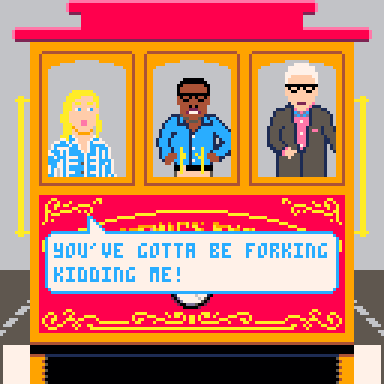 I enjoyed the humor (was a lot of it lifted directly from The Good Place?) and the dialog seemed to be right at home with the source material. This was a nice experience. I really enjoyed the presentation and the visuals. As far as feedback goes, it would have been nice to have a dialog skip button. I read much faster than the text displayed so it felt like things moved more slowly than they should. I think PICO-8 gives you two buttons, so maybe one could skip the dialog and the other change the track? It would have been nice for a little more variation in the music and some repeating noises for the different characters would have been nice also. Overall a great job! I loved this episode and seeing it recreated in game form was a treat! Thank you! Yes, some of the dialogue (and most of the joke concepts) were lifted from the episode. Much of the dialogue was rephrased, but some direct quotes were included. I absolutely agree about the feedback and would have included everything you suggested if I had more time for the jam. There were other improvements I wanted to make as well, but a lot of the scope had to be trimmed, and I still ended up submitting a little bit after the deadline. The last day of dev was essentially a major crunch to ensure all of the main functionality and content for the game loop was in place.